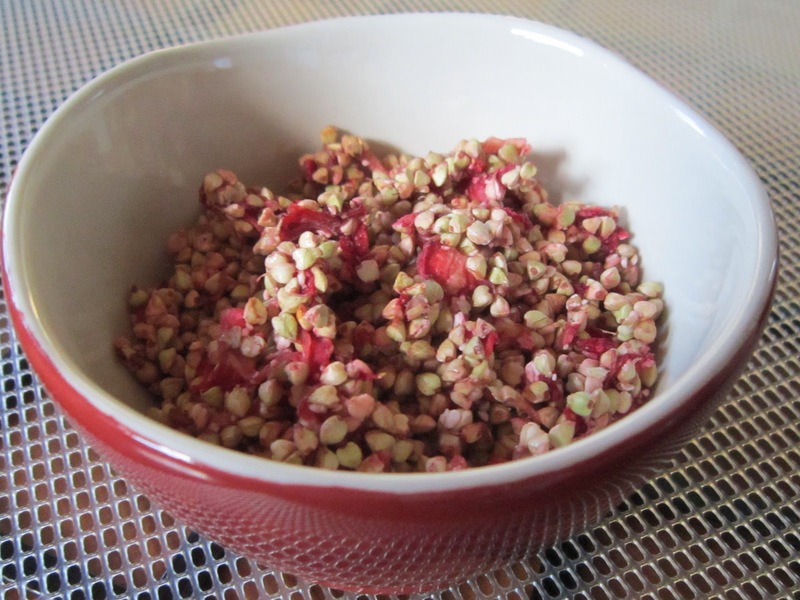 Raw cereal is also something that I like to make in my dehydrator. Kids love cereal and there's a little kid in all of us! Making your own cereal is the best way of controlling how much sugar your kids (or you) are getting from their cereal breakfasts. Parents want to give their children good things to eat and it's easy to believe that cereal is a healthy start to their kids busy day, but in reality most boxed cereals are high in sugar and sugar has no nutritional value. Myself, I would question the quality of the other ingredients as well as I have read that most commercial cereals today have been made with GMO ingredients. No frankenfood for me thanks! Healthy cereal can also be tasty cereal. It has to be or the kids won't eat it. I have to warn you - if it tastes too good, you will be making a lot of it! It not only makes a great breakfast but also a great snack. One of my favorites is chocolate buckwheat clusters, pictured below. It's simple, crunchy and sweet enough, and features sprouted buckwheat and raw cacao. Tastes great with some sliced bananas or raspberries and your favorite milk or nut milk. Mix well and spread on teflex dehydrator sheets and dehydrate 12 hours or overnight at 110 until crunchy. Stir after a few hours to form clusters. For last couple hours you can remove teflex sheet and continue drying on mesh sheet. Makes 4-6 servings. Store in airtight container. This is another simple cereal using sprouted buckwheat and fresh strawberries, It's light, crunchy and goes great as a topping for bananas and plain yogurt (my mouth is watering just thinking about it). Move over special k with strawberries - there's a new kid in town! Mix well and spread on teflex sheets and dehydrate 12 hours or overnight at 110 until crunchy. Stir after a few hours to form clusters. Store in airtight container. Serves 4-6. There are many great recipes to be found for all kinds of granola's, baked and dehydrated, and also some shaped cereals if you really want to get creative. I like the simplicity of the above cereals and the fact that both require few ingredients and I get to control the quality of the ingredients! Having your kids help in preparing home made cereals is a great shared activity and it's one way to get them to want to eat them instead of the boxed brands they are used to. Next post I will be sharing some delicious raw snacks made in the dehydrator. Hope everyone had a fabulous weekend! Thanks so much for your kind comment and for following my blog...I hope you have found some things helpful! There is a spot on the right hand side of the blog where you can put your email address in to follow by email. Take care and please comment again!